Nine Days Out…Central Connecticut State and (the Former) Team Germany are Ready! Are You? We’re nine days away from the start, racers! Everyone’s hunkered down and working hard, from the brief e-mail correspondence we’ve received, but we’re still hoping teams will send us updates and photos of their buggies! Drop an e-mail to msfc-cs20-social-media@mail.nasa.gov today! 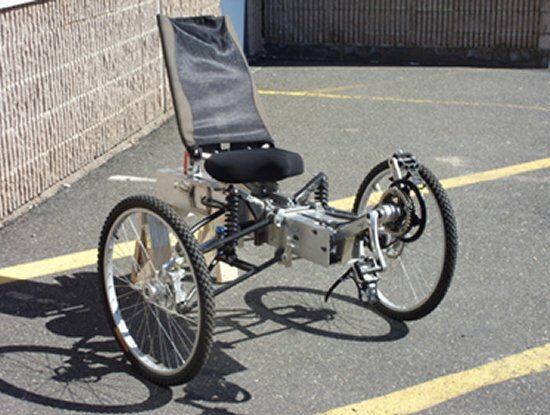 The Central Connecticut State University moonbuggy team is working overtime to prepare for the upcoming race in Huntsville. Project managers Walid Alomari and Jeffrey Cloutier reported a nearly finished vehicle as of March 19. We are slightly behind schedule but we are confident that our vehicle will run well. The testing and tuning phase should go well, because each of the systems teams knows their area well and will be able to troubleshoot any problems quickly. One half of the Central Connecticut State University buggy, mid-construction. concentrate, the team has a chance to complete its fine tuning. The final decision about drivers for the two heats are going to be competitive decisions. A two-part course will be developed [at the school], and all applicants will have an opportunity to compete for time in the endurance and maneuverability events. Thanks, Jeffrey — and good luck in the driver challenge! The NASA Moonbuggy Race demands utmost commitment of its participants. 11 months after the last event, we’re in final preparations again! After experiencing four moonbuggy races and taking part myself three times successfully, I would have thought there’d finally be a routine. But far off. Again, we’re under pressure to get everything done on time. Many things are different this particular year, and that’s why I want to offer some insights and encourage people to participate. The original Team Germany does not exist anymore. Most of them have graduated from high school and are now all over the world — also thanks to the unique references of the moonbuggy race. 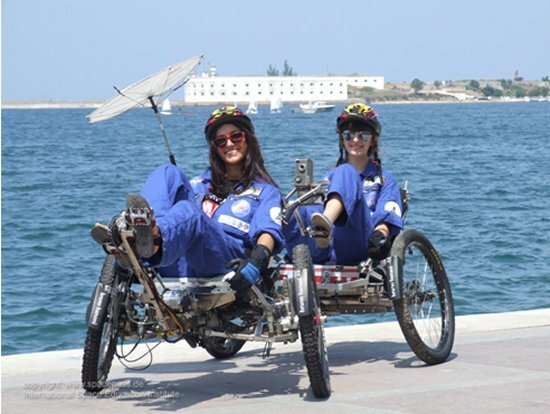 Therefore we have been focusing on promoting the moonbuggy race and space education throughout 2009. The German moonbuggy was on the road in eight European countries, traveling more than 10,000 km (6,200 miles). Our core task was to raise awareness in Eastern Europe, especially Ukraine, Hungary and Russia. There was a lot of interest and astonishment everywhere. We did 120 workshops and events with and for students. We invited Russian space students to moonbuggy workshops in Germany and gave countless talks at schools. German team members Vita, left) and Anna at the port of Sevastopol, Ukraine. We were especially delighted to cooperate with the Chamber of Trade in Leipzig, and their vocational education center. As a result, our moonbuggy is now entirely modeled in CAD, and with a prototype series of five slightly different types, we have a proper fleet that serves test and training purposes. In the past few years, the only important topic for the first three months of the year was the moonbuggy. That required the team leader and most of the students to put in 18- to 20-hour days. It’s a bit different today. We’re still very busy, but we manage to call it a day on time and make time for family now and then. The students are more independent, and there are more of them. It’s not just individual responsibilities anymore, but more delegation of tasks throughout the team. However, traveling to the competition is still an open book. There are new hurdles to take. There are different luggage regulations. Last year, each passenger was permitted to bring two pieces of baggage for free — today, the second suitcase carries a fee of 100 Euros (and a third is 400 Euros!). Our moonbuggy fits into seven suitcases, but we’re only 4-5 passengers. So we’ll have to pay dearly to get ourselves and our buggy to Alabama. The selection of racers and the Huntsville-bound team has become more complicated. The old hands have left high school. The youngsters, however, have a lot of respect for the race. But most of them don’t feel ready for it yet, or aren’t able to raise the high travel costs (German schools don’t sponsor the program financially). It has been even more difficult to find our female racer: One of our initial candidates is in another competition; another is abroad on a student exchange; a third had a skiing accident. The actual construction of the moonbuggy is more routine now. But will it — with its many new refinements in stability and weight reduction — be ready in time? And will the new test driver meet the requirements? We will find out in April! Good luck getting the travel worked out, ISEI racers! And we look forward to meeting the new team. Our thanks to Regina Peldszus for translating Ralf’s material. You can read the International Space Education Institute’s own blog here. For more photos of the team and their buggy, go to http://www.flickr.com/photos/spaceeducation/sets/72157623619379794/show/.